The comparison matrix below provides a preview of the performance characteristics of commonly used materials. Additional materials may be available upon request. You can select from a vast array of material and panel size options. Choose from a variety of standard panel compositions and sizes or custom design a composite panel by carefully selecting the right materials and processes to build a composite panel solution that meets your requirements. 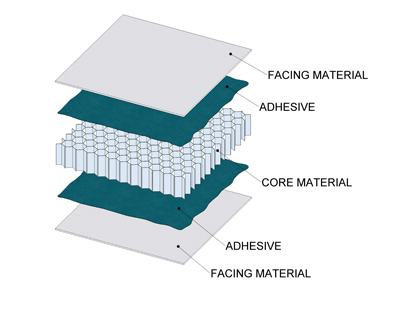 Core Materials options include polypropylene honeycomb, aluminum honeycomb, insulated foam, paper honeycomb, wood. Facing Materials options include aluminum, FRP, gel coated fiberglass, rubber, vinyl, steel, ABS and wood. Our professional application experts are ready to work with you in confidence to determine your specific panel application requirements. Together you’ll develop the composite panel solution that’s just right for you. Call us at 1.866.274.2731 ext. 226.